Oh, Mariah Stewart has created another beautiful yet loving romance story that it will touch the reader heart. She has brought two flaw character that will fall in love but it will be an challenge since they both have things to overcome. Jamie is a beautiful women that she has to bury her mother and handle all of her family affairs that she discover that she was adopted. Jamie feels very betrayal from discovering that she was adopted that she begin to question everything. I truly feel for Jamie because she never knew that she was adopted that she feels betrayal and confusion about her self. However, Jamie is determined to find out who is her birth mother that she travel back to the hometown of Chesapeake. It will be a challenge for Jamie to discover her birth mother but she is determined to find out. I think reader will admire Jamie because she is determined to find out so she cannot have regrets later on. When Jamie arrive and settles in Chesapeake, she gets to meet a hard-working yet hot Daniel. Daniel has been working long and hard for his Inn that he does not know how to lose his reign. I was truly amused when Daniel was getting frustrated with Jamie because Daniel does not know how to get loose. Jamie is the perfect match for Daniel because she knows how to loosely up Daniel when necessary. Their romance be may take awhile to build up but it is totally worth the wait. 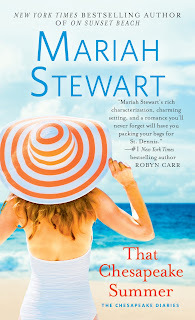 Mariah Stewart has create an vulnerable romance story that it will take the breath away of the reader! Four Star! ABOUT THE AUTHOR: MARIAH STEWART is the award-winning New York Times and USA Today bestselling author of numerous novels and several novellas and short stories. A native of Hightstown, New Jersey, she lives with her husband and two rambunctious rescue dogs amid the rolling hills of Chester County, Pennsylvania, where she savors country life and tends her gardens. Visit her website at www.mariahstewart.com, and like her on Facebook at www.facebook.com/AuthorMariahStewart.